Today I was sorting through an accumulation of a thousand old and mainly common stamps of Russian Levant. I was very surprised to come across one (just one) Perfin as shown above with a normal stamp of the same type beside it. All private Perfins on Imperial Russian stamps are scarce - they were not authorised until 1907 - and any Perfin on a proper commercial cover must be reckoned rare - when did you last see one in auction? 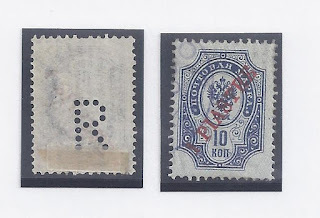 For Russian Post Offices in China and Levant, perfined stamps are very scarce: the Levant post offices closed in 1914 so there is only a seven year period in which Perfins are possible there. For the Levant post offices, Perfins of Credit Lyonnais ("C.L.") and the Imperial Ottoman Bank ("B.I.O.") are the only ones likely to be seen and then only on loose stamps. The Perfin above is mentioned in a 1975 article by V. Maxa in the Bulletin of the Perfins Club. He regards it not as a Roman "R" but as a Cyrllic "Ya". Either way, he is not able to tell us the name of the organisation which used it. Can any of my readers assist? Even a guess would be helpful! I have found this perfin only in Russian Levant stamps from Constantinople, not in Levant stamps of other countries. In my opinion this perfin was used by the R.O.P.i.T., the Russian organization for steamshipping and trade, which had postal rights in the Levant and Black Sea area. The company had an office in the port of Constantinople.